Kingler in game: 930 Who? Important notice! Pokemon Kingler is a fictional character of humans. 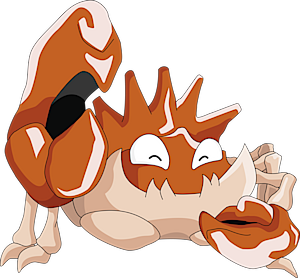 Kingler is a crustacean Pokémon resembling a crab. Its strong shell covers the outside of its body, featuring a red upper-half, and a light tan lower-half. Its upper half is topped with six tall, thin spikes that resemble a crown. Its lower half doubles as its jaw with six fangs overlapping its upper body. Its two outer fangs are much larger than the inner two, and are roughly half as tall as Kingler's entire body. Its hips are visibly protruding from its lower body connecting its long, thin legs with claw-like feet. Kingler's main feature is its red claws. Its left claw is roughly twice as large as the other and hard as steel. Kingler is often found on the edges of water, usually the ocean. 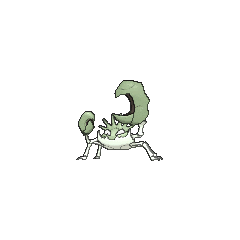 It has been observed using its powerful claws to pry open the shells of Shellder and Cloyster. 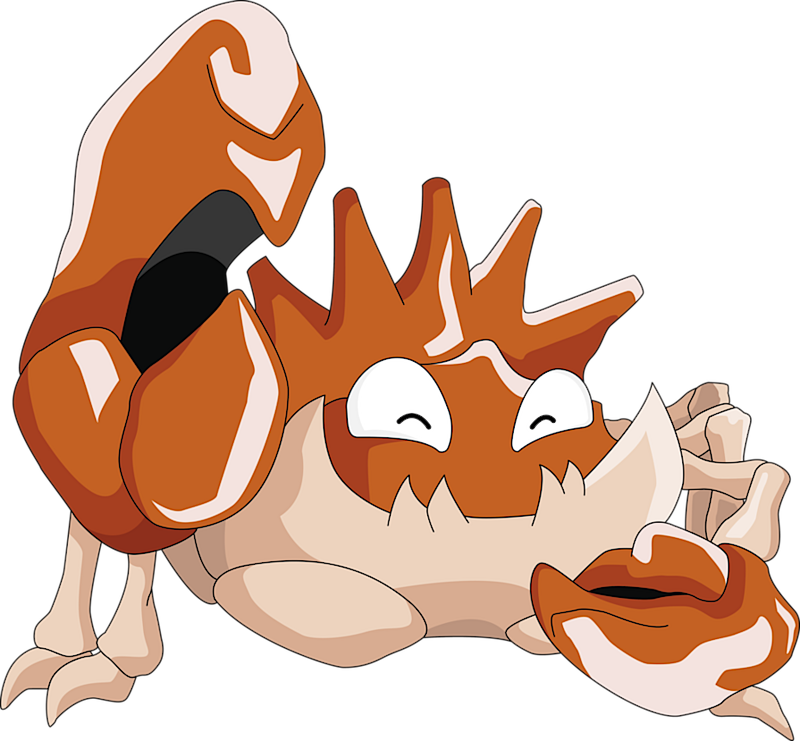 While Kingler's large, left claw is it main tool for offensive maneuvers, it is so large and heavy that Kingler can barely lift it. It causes balancing problems and Kingler may quickly become fatigued from continuous use. 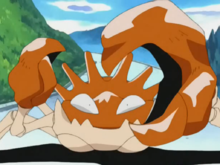 However, it has been shown to communicate with other Kingler by waving its pincers around. 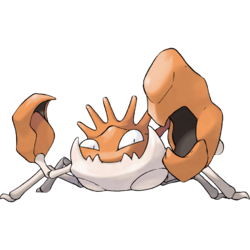 Ash's Krabby evolved into a Kingler in Round One - Begin!, during Ash's first round battle in the Indigo Plateau Conference. 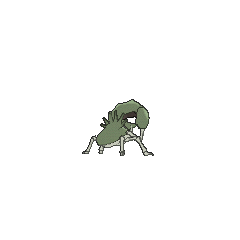 A Kingler appeared in The Battle of the Badge, under the ownership of Giovanni. He used it in his Gym battle against Gary's Arcanine. Despite the type disadvantage, Giovanni's Kingler was defeated. He also leant it to Jessie, James and Meowth when he put them in charge of the Viridian Gym. Kingler managed to put Ash's Bulbasaur on the back foot, but was driven off by Pikachu. 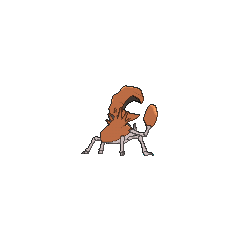 A Kingler appeared in Expedition to Onix Island!. Kingler first appeared in Showdown at Dark City as one of the Kaz Gym's Pokémon. A Kingler appeared in Princess vs. Princess competing in the Queen of the Princess Festival contest. A Kingler appeared in Mewtwo Strikes Back. A Kingler was among the Pokémon controlled by Cassidy and Butch in Pikachu Re-Volts. A Kingler, under the ownership of an unnamed Trainer, was treated by Nurse Joy in The Joy of Pokémon. A Kingler appeared in Beauty and the Breeder where it participated in a Pokémon breeding competition. A Kingler was one of the Pokémon living at Temacu's father's lab in The Heartbreak of Brock. A Kingler was under the ownership of a Trainer who was waiting in line to register for the Whirl Cup in Octillery The Outcast. Multiple Kingler also appeared in The Power of One and Pokémon Ranger and the Temple of the Sea. 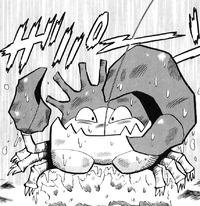 In Pokémon Adventures, Kingler is shown under the ownership of several Team Rocket Grunts, and one is later shown in a flashback during Giovanni's speech regarding experimented Pokémon that were shipped on the S.S. Anne under the owner ship of Harry in Long Live the Nidoqueen!?. 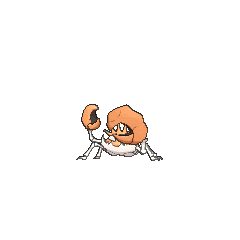 In The Last Battle XIII A Kingler was one of the Pokémon sent to help the fight in Ilex Forest. Much later, in the FireRed & LeafGreen chapter, another Kingler is shown having been captured by Carr to try to ambush Red and Blue, but it is frozen and beaten by the newly arrived Lorelei. He's decent, but he's slow and his Special is terrible, so he'll die to two strong special attacks. Alakazam KOes him with two Psychics, as does Exeggutor. Starmie can KO him in two Thunderbolts, Zapdos OHKOes him, and the Razor Leaf users destroy him as well. He's meant for UU--it takes too much effort to put him in a favorable position in OU, and when you actually do, he's not all that great either. Swords Dance and sweep is the purpose of the moveset. With one Swords Dance, Kingler's Hyper Beam OHKOes Chansey and will sometimes OHKO a full-health Starmie. Starmie is one of Kingler's biggest counters, but once it's paralyzed, Kingler gets a decent chance to dispose of it, although Starmie remains amazing at getting critical hit Thunderbolts. Kingler really can't be used early in the game--he can't switch into things too well, especially special attacks. He isn't exactly fast, and Thunderbolt is very common, which means many healthy Pokemon can kill him. He's best used as a late-game sweeper, like most things with Swords Dance. It is probably better to use Crabhammer for the critical hit rate rather than Surf, even though the former is inaccurate, due to his low Special. Blizzard can perhaps be useful, but his Special is horrible, so it'll do pathetic damage even when it's super effective. Guillotine can work, but only if OHKO moves aren't banned. Gengar takes little from Surf and nothing from Body Slam, making him the best Kingler counter you can have. Exeggutor easily takes the Water attacks, and his defense allows him to shrug off a boosted Body Slam in order to get a Sleep Powder in. Venusaur can do the same thing, although his defenses aren't quite as stellar. Kingler easily falls to special attacks, so Zapdos and Jolteon are good Pokemon to switch into it with their STAB super effective attacks and ability to outspeed it. In UU, Tangela resists Water and can paralyze with Stun Spore or set up with Growth and Mega Drain. Golduck can Amnesia in its face, although it doesn't like a Swords Dance-boosted Body Slams. Electabuzz can threaten with STAB Thunderbolt if you can get it in, and the same can be said about Magneton. Charges for two to three turns; returns double the damage received in those turns. 10% chance to freeze the target. 30% chance to paralyze the target. 10% chance to lower the target's Speed by one stage. User takes one quarter of damage dealt in recoil. Boosts the user's evasion by one stage. Boosts the user's Defense by one stage. User cannot move next turn, unless opponent or Substitute was KOed. Copies a random move the foe knows. Boosts Attack by one stage if hit, but can only use Rage after that. The user goes to sleep for two turns, restoring all HP. 30% chance of causing the target to flinch. Takes 1/4 the user's max HP to create a Substitute that takes damage for the user. Boosts the user's Attack by two stages. User takes a quarter of damage dealt in recoil.